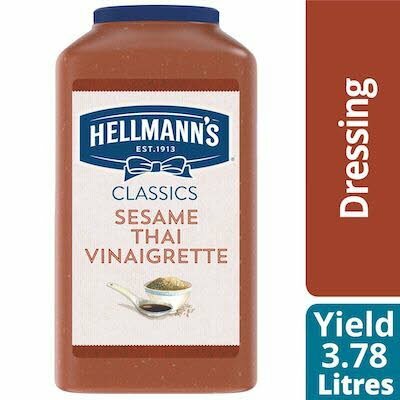 Hellmann's® Sesame Thai Vinaigrette is an exquisite blend of authentic Asian seasonings, roasted sesame seeds, garlic, crushed red peppers, ginger, soya sauce and rice wine vinegar for a truly exotic taste sensation. Hellmann's® Sesame Thai Vinaigrette is made with real sesame and extra virgin olive oil and does not contain artificial coulors or flavors or high-fructose corn syrup. The Hellmann's® brand is recognized throughout the world for unrivaled quality and flavor and its commitment to real, simple ingredients, like extra virgin olive oil. Hellmann's® Sesame Thai livens up green salads, noodle dishes, broth soups and can also be used for bound salads and on sandwiches.